What Does Fertility Really Mean? Fertilization should produce visibility averaging 18 to 24-inch visibility. Typically, we associate fertilizing a lake with growing microscopic plankton to feed newly-hatched fish. When you look deeper into the water, you see fertilization triggers a long line of other beneficial outcomes. While on a trip to Tennessee, Bob leaned over the side of the boat to assess water quality. He sensed something different was occurring. The lake obviously had been fertilized. Water had that familiar rich, bold, light green color that follows application. 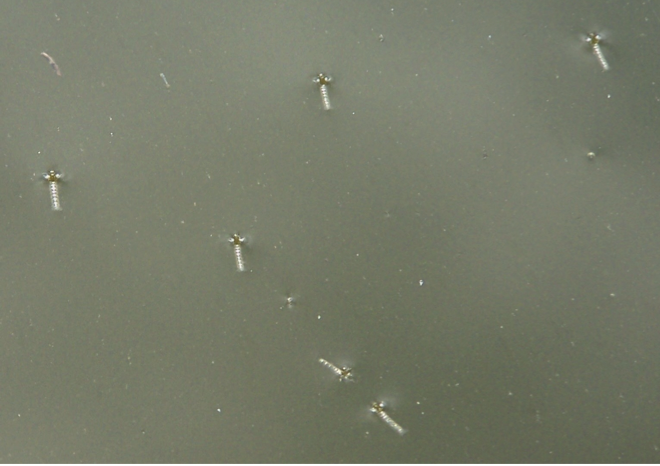 Plankton, tiny, single cell morsels of plants were teeming throughout the upper water column. It was a familiar green tint he had seen many times. At the same time, there was an amazing hatch of aquatic insects. The surface almost had a sheen of white, cottony substances floating on the windward side of the surface. Closer inspection revealed the white stuff was little husks, shells of newly-metamorphosed bugs, mostly midges. Literally, there were millions of them. Bluegill pluck damsel flies from primrose mats. Two guys who often fish the lake had noticed this biology, but didn’t understand the significance of it. It seemed a contradictory occurrence. Green water and bug husks don’t usually co-exist. The timing was off. A newly fertilized plankton bloom doesn’t yield so many bugs so fast. The conclusion was obvious…the lake had been fertilized recently to boost an already existing bloom. 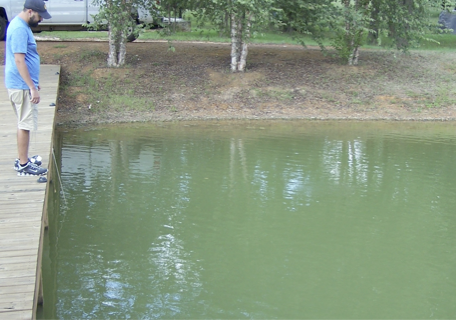 When Bob commented on what he saw, one gentleman advised the lake had been treated within the last week, plus off and on all Spring and Summer. Fertility is one of the most misunderstood concepts in pond management. 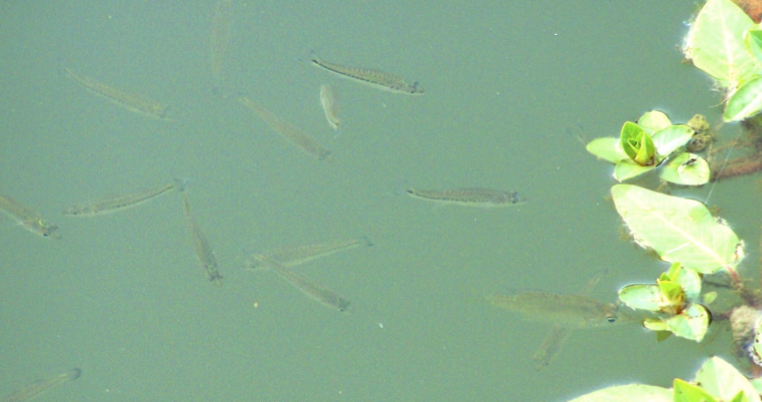 Plankton provides a food chain for all critters around a lake. We fertilize water to dissolve food into the water column. Those nutrients, food for plants, feed tiny little plants which quickly grow, reproduce, and color water that rich, green tint. As the tiny plants grow, microscopic animals come to life. That’s because these little animals, zooplankton, eat the tiny plants. As pond managers, you learn to read a bloom. Early color resembles split-pea soup. Water visibility is around 18-inches. As the bloom matures, color changes. That’s because zooplankton aren’t the same green color as phytoplankton. When the shift occurs, color changes to more olive green. Then it goes to an olive/brown shade. This signals zooplankton are having their way with phytoplankton. Left unchecked, olive/brown color shifts to brownish/olive, to brown, to clear. When that occurs, zooplankton overtakes and overeats phytoplankton, then crashes. 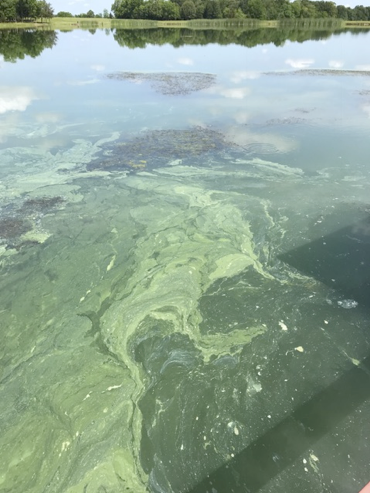 When color bends toward brownish/olive, many pond managers add a small dose of fertilizer to grow more phytoplankton that feeds the growing zooplankton population. Largemouth bass grow quickly on plankton. Healthy blooms improve survival rates of all newly-hatched fish and significantly increase lake productivity. Here’s where things change even more. The lake had been fertilized several times since water temperatures hit the lower 60’s last Spring. The perpetual bloom helped the lake produce abundant phytoplankton, which fed zooplankton, which nourished millions of aquatic nymph larvae, which fed burgeoning shad, bluegill, and bass fry, which added to the food chain for fat, healthy largemouth bass. The valuable insect hatch provided food for creatures beyond the water line. Dragonflies, damselflies, and midges now feed on mosquitoes and other insects while becoming a buffet line themselves for birds, frogs, and other critters that make a living somewhere near the water. Fertilizing this lake supplied basic nutrients that provided the impetus for a chain of events that rippled beyond the obvious, to feed baby bluegill, bass, and shad. Fertility benefited this particular lake well beyond the shoreline. Hollow larvae casings from bug hatch. Closely monitor water quality when fertilizing. This entry was posted on Friday, January 18th, 2019 at 3:26 pm	and is filed under News & Updates. You can follow any responses to this entry through the RSS 2.0 feed. Responses are currently closed, but you can trackback from your own site.